Do you celebrate the Day of the Dead? Does that seem like a weirdo question? In South Texas, Day of the Dead, or as it’s commonly called, Dia de los Muertos, or even more specifically, how we shout it: it’s OMT!’s BIRTHDAY (fine. i’m probably the only one shouting), is YUUUGE! It falls on November 2nd of every year (huh – just like my birthday!) and is not meant to be scary or ghoulish, no matter the similar use of skulls and bones. It’s a beautiful day of remembrance of the souls who have passed from this life to the next. Here, folks gather in cemeteries and celebrate with a party, including the deceased’s favorite foods and drinks. Did ya know Fiesta Ware has a glass for that? 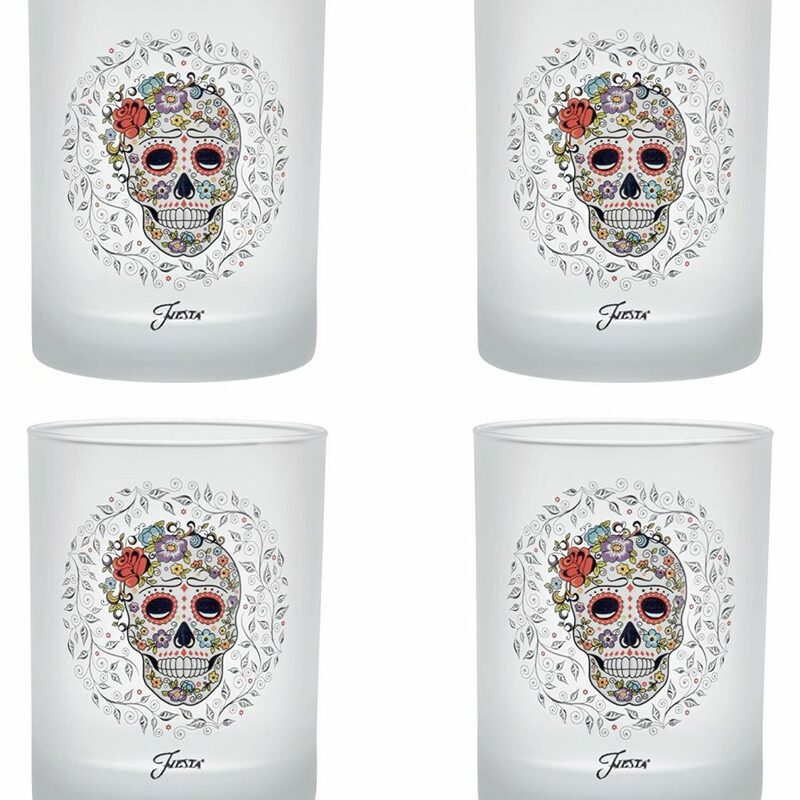 ~ Officially licensed Fiesta Skull and Vine Sugar Design. 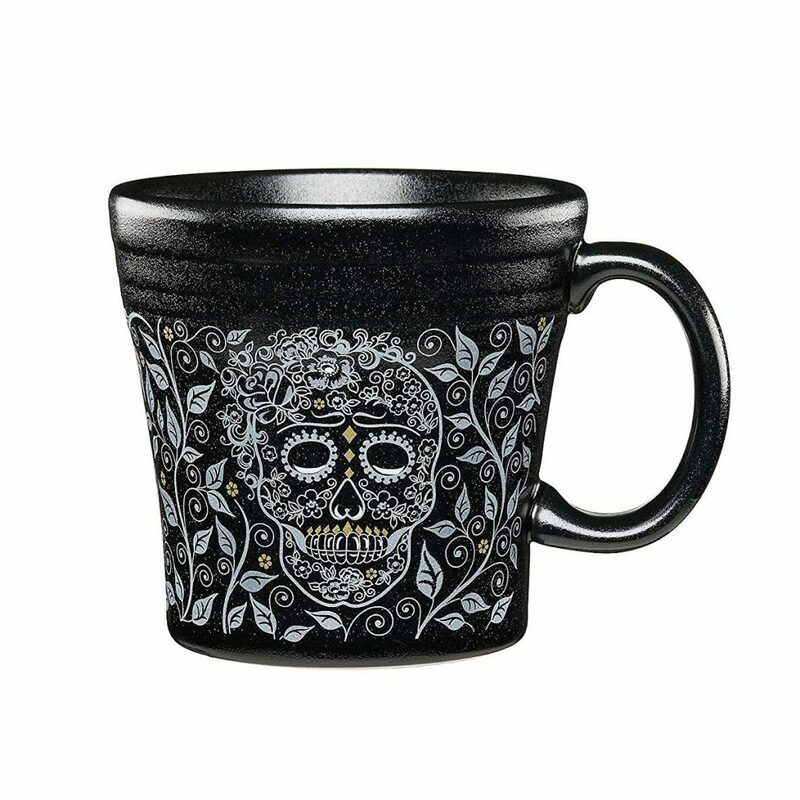 ~ Features a detailed colorful skull design highlighted with a botanical vine. ~ The print is on one side of glass. ~ Set includes (4) Four Frosted Pint/Pub Glasses. ~ These glasses hold 16 US fluid ounces filled to the top. ~ Made in the USA. 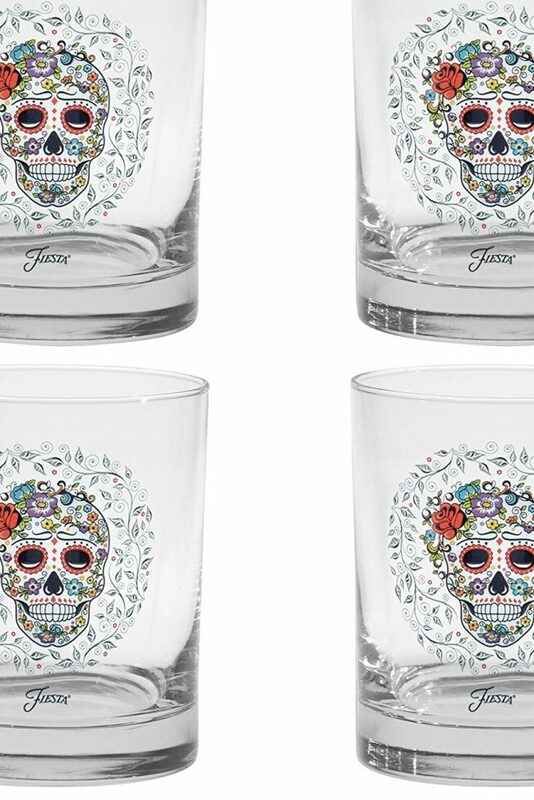 ~ Fiesta Skull and Vine Sugar glassware complements Fiesta Dinnerware. How does a gal decide?! Frosted! Nooooo, clear! Nooooooooo, frosted!! NO! CLEAR! If that isn’t hard enough, Fiesta Ware also has this line, complete with coffee cups, plates, and serving ware. ~ Stoneware, ceramic, lead-free glaze. ~ Microwave, dishwasher safe and oven proof. ~ Manufacturer’s five year chip replacement warranty. I’ve had a long love affair with Fiesta Ware (I see you have too!) and that they have added these two lines is just one more gorgeous reason for my money to be happily handed over! I’ve linked several products below. You pick. I can’t do it for you! I can barely do it for me! Today starts the pre-birthday celebration for OMT! 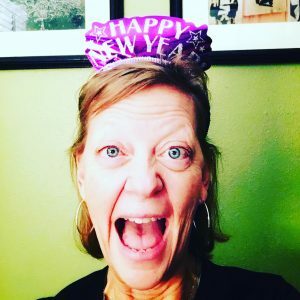 That I was born on Dia de los Muertos has always been a source of fun for me (It’s also All Soul’s Day in the Catholic church – I seeee dead people – fun!). I hope I’ve offered you a bit, too.